A couple of Birthright participants have asked me what is going with these headlines about a United Nations vote regarding the Temple Mount in Jerusalem. So let me briefly try to explain three things in this episode. What is UNESCO, and what is this controversy about? Second, what does this resolution say and why are people so upset? And third, why is this controversy even happening. The United Nations Educational, Scientific, and Cultural Organization, or UNESCO, is an agency of the United Nations that focuses on issues of humanitarianism and human rights, education for all children, cultural diversity, and scientific cooperation, amongst other endeavors. Within UNESCO is a committee called the World Heritage Committee. They are in charge of designating World Heritage Sites. Here in the United States there are 23 such sites, including Yosemite, Yellowstone, the Everglades, the Grand Canyon, and others. 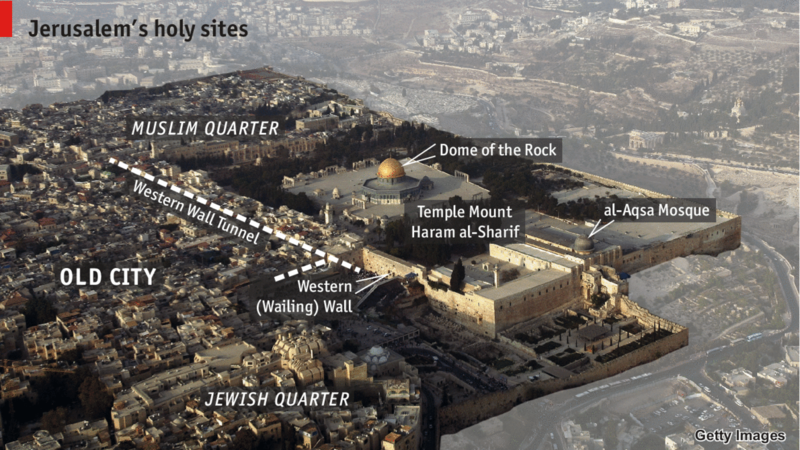 In 1982, The World Heritage Committee designated the Old City of Jerusalem as one of these sites. And that brings us to what today’s controversy is about: the nature of the Temple Mount. You know that the Western Wall in the Old City is Judaism’s holiest site. The Western Wall, and its three counterpart walls, hold up a massive platform. On top of that platform are two main structures. The first and most visible is the Dome of the Rock, that colorful gold dome that dominates the Jerusalem skyline. A couple hundred yards away with a gray dome is the Al-Aqsa Mosque — the third holiest spot in the world for Muslims. Here’s where it starts to get controversial. Muslims call this platform al-Haram ash-Sharif, which means the Noble Sanctuary. Jews call this platform the Temple Mount. Both the Dome of the Rock and the Al-Aqsa Mosque have been up on this platform for about 1,400 years. For almost 600 years before that, there wasn’t much there. But before that, for roughly 1,000 years, this platform was the site of the Jewish Holy Temple, the central site of worship and Jewish life in ancient times. This temple was destroyed by the Romans in the year 70 CE. All three religions — Islam, Christianity, and Judaism — agree that the Temple Mount, or al-Haram ash-Sharif, is religiously significant because Abraham — the founder of all three faiths — was there. On October 18, the World Heritage Committee voted in favor of a resolution, titled “Occupied Palestine”, that aims to set forth rules regarding the preservation of holy sites in the Old City, especially with respect to the Temple Mount/Noble Sanctuary. It’s important to note that this resolution is non-binding. 24 countries voted in favor of the resolution, 6 voted against, and 26 abstained. By only referring to the Temple Mount by its Islamic name — al-Haram ash-Sharif — the committee is minimizing, if not outright trying to eliminate, any notion of Jewish historical connection to the platform. The continuous reference to Israel as the “occupying power” of the Old City. The resolution’s sole focus on “Israeli acts of aggression” against the Temple Mount and other Islamic holy sites. On UNESCO’s refusal to fully acknowledge the Jewish connection to the Temple Mount, Israel stands on absolutely firm ground. UNESCO’s omission is preposterous. Jerusalem has been the holy site for Jews — and, by extension, Christians — since at least the year 1,000 BCE. The Temple Mount itself was the location of the Second Temple, which was built in the 5th century BCE and destroyed in the year 70 — nearly 600 years before Islam even became a distinct religion. When the Second Temple was destroyed in the year 70 CE, the Jewish people lost their national independence, and thus their sovereignty over Jerusalem. In their place came the Romans, then the Byzantines, then the Muslims, then the Christians off and on during the Crusades, then the Muslims again in the form of the Ottoman Empire, then the British, and then the Muslims again in the form of the Kingdom of Jordan. In the 1967 Six Day War, which saw Israel emerge victorious against several invading Arab armies, the Israeli army captured the Old City, and the Temple Mount, from the Jordanian army. The government made the decision that while the Old City, and the Temple Mount, would come under Israeli territorial control, the Temple Mount itself would remain under the control of the Islamic religious authorities, who themselves were under the authority of Jordan. That decision has held for the last 50 years. To this day, the Old City is considered by Israel a part of its territory. The international community doesn’t officially recognize it, and the Palestinians say that the Old City, which is a part of East Jerusalem, will someday be their capital, so Israel isn’t allowed to claim it as their territory. Still, for now, it is firmly in Israeli hands. But when you go up to the Temple Mount, you are under the auspices of the Muslim authorities, who make all the rules governing what goes on up there. Jews are forbidden to pray on the Temple Mount. Access to the platform itself is often restricted to only Muslims. This system is called “the status quo.” You’ll hear this a lot in discussions about what goes on in the Old City. The status quo — Israel controls the Old City, and the the Muslims control what happens in and around the Muslim holy sites at the Noble Sanctuary. And that brings us to Israel’s third complaint: that the UNESCO resolution focuses solely on what the draft calls “Israeli acts of aggression”. The status quo arrangement has never sat well with certain groups of Jewish right-wing religious extremists, who, like extremists anywhere, believe that this particular holy space belongs solely to them. It is true that in recent years there has been an uptick in these extremists causing trouble. They do occasionally band together and race up to the Noble Sanctuary in order to try to pray, or to rile the Muslims, or to make such a scene that the Israeli police are forced to temporarily shut down all access to the Temple Mount, including for Muslims, in order to prevent a riot. They also do have some political power, especially within the current, right-wing government of Israeli Prime Minister Benjamin Netanyahu, who they lobby to make changes to the status quo agreement in order to give Jewish authorities more power. But I think it’s too much to say that the Israeli government itself is trying to upend the status quo agreement. The government has not sought to make major changes to the agreement with the Muslim authorities, or to assert greater Israeli control over the Temple Mount/Noble Sanctuary. A little over a year ago, at the beginning of a wave of violence that erupted between Israeli and Palestinians, Palestinian leaders sought to fan the flames of anger by claiming that Israel was trying to forcibly change the status quo. Although this was untrue, it led to riots, and Palestinians stabbing Israelis, and Israeli soldiers shooting Palestinian attackers, and on and on. But rather than strengthening the Palestinian leadership, all this violence has further weakened it. A recent poll showed that most Palestinians think that the last year or so of violence has not helped their cause. So the Palestinian leadership has to strengthen its position through political means, rather than through violence. Part of that effort is on the diplomatic international stage. The UNESCO vote is an opportunity by several Arab countries to demonize Israel over these allegations about the Temple Mount. And like I said, there are some legitimate complaints. The mayor of Jerusalem has put forth a proposal for a tourist cable car system that would encroach on Palestinian territory, and impact the Temple Mount area and, as the mayor claimed, serve the ideological goals of affirming Israel’s complete control over Jerusalem. But the resolution goes too far by focusing solely on Israeli “acts of aggression” and not on any provocations by the Palestinian side; and, most egregiously, by denying any Jewish historical connection to what is the holiest place in Judaism. So what now? On October 26, 2016, the World Heritage Committee took another vote on a similar resolution to try to patch things up and…voted in favor of it again. Although some of the wording has been changed to indicate more explicitly that the Old City is sacred to Muslims, Christians, and Jews, the resolution still only refers to the Temple Mount by its Muslim name and it is still, as Israel and the United States and others claim, totally one-sided and inflammatory. Israel has recalled its UNESCO ambassador in protest. The head of the UNESCO agency herself has come out against the resolution. And Israel still refuses to allow a UNESCO team to come inspect holy sites in the Old City, which is one of the main accusations in the resolution. But, says Israel, we’re not going to allow UNESCO to poke around when it has such an obvious, anti-Jewish, and anti-Israel agenda. What happens next? Who knows, it’s the Middle East.